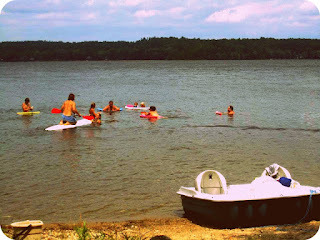 We got home this afternoon after a wonderful weekend at the lake for Fam Jam 2012. Though we were down a few family members, we had a beautiful day on Saturday, sunshine for some of Sunday followed by a rainy day spent inside watching the Olympics, lots of great food, games, and lots of laughs. 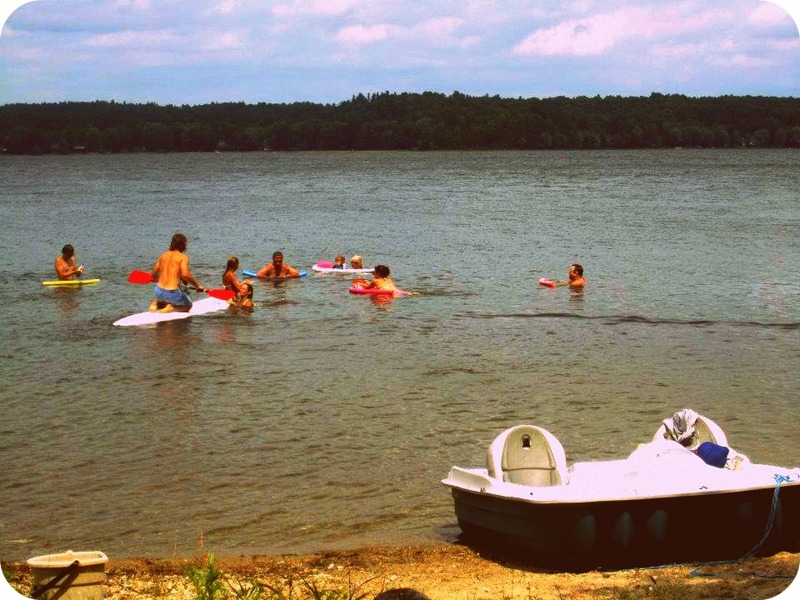 Sunday, in between rain showers, we managed to get almost everyone out into the lake at the same time. Saturday night was a very sweet celebration of our upcoming wedding. My cousins set up an awesome photo booth complete with the most incredible (and appropriately hilarious) props ever. 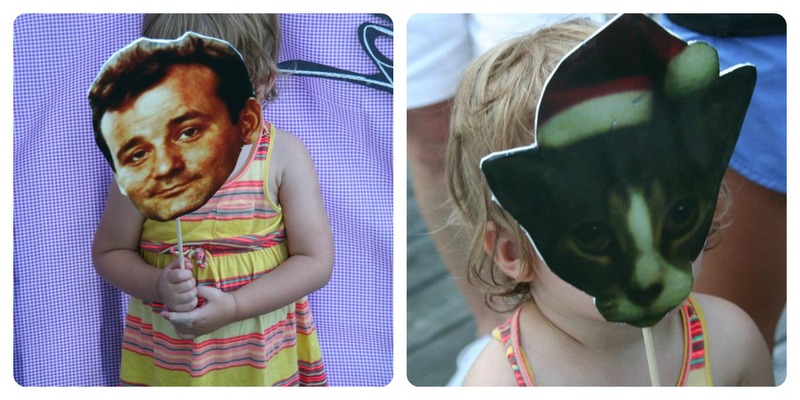 Bill Murray: the actor & the cat. They also organized a wine shower (we are now the very proud and very excited owners of a large number of bottles of wine) and made a desert of the best thing ever: s'mores. Done 3 ways. S'mores mini pies, s'mores cookies, and s'mores squares (made like rice krispies squares only with golden grahams and chocolate chips) (these might have been my favourite considering I had 3 of them). 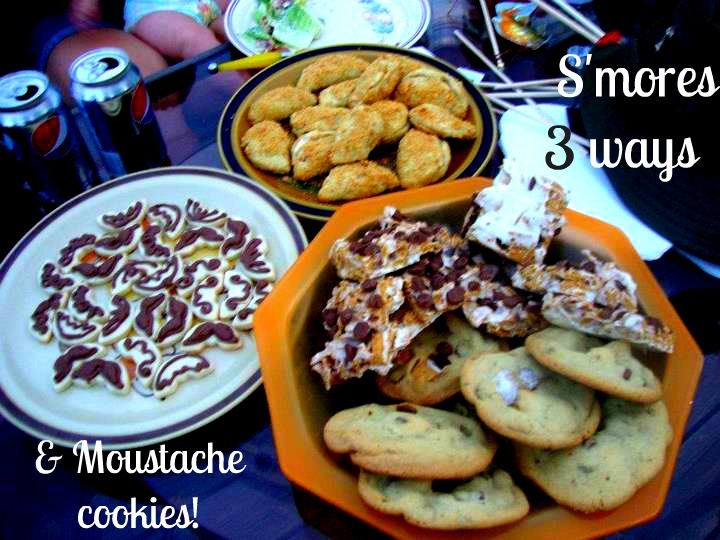 They also brought moustache cookies as a thank you for everyone who sponsered my cousin during Movember. He is a big supported of Movember and raises a lot of money for prostrate cancer research by growing a respectable (or not so respectable) moustache. Currently, he's rocking a pretty serious beard, to his wife's dismay and to my dad's awe. On Sunday me, John, my sister, and her boyfriend all got to work in the kitchen to make a meal for our 'Cinqo de August' night. In trying to come up with a theme it was either that or 'Olympics' but to come up with a meal for 'Olympics' was impossible. And Mexican food can be done relatively on the cheap. 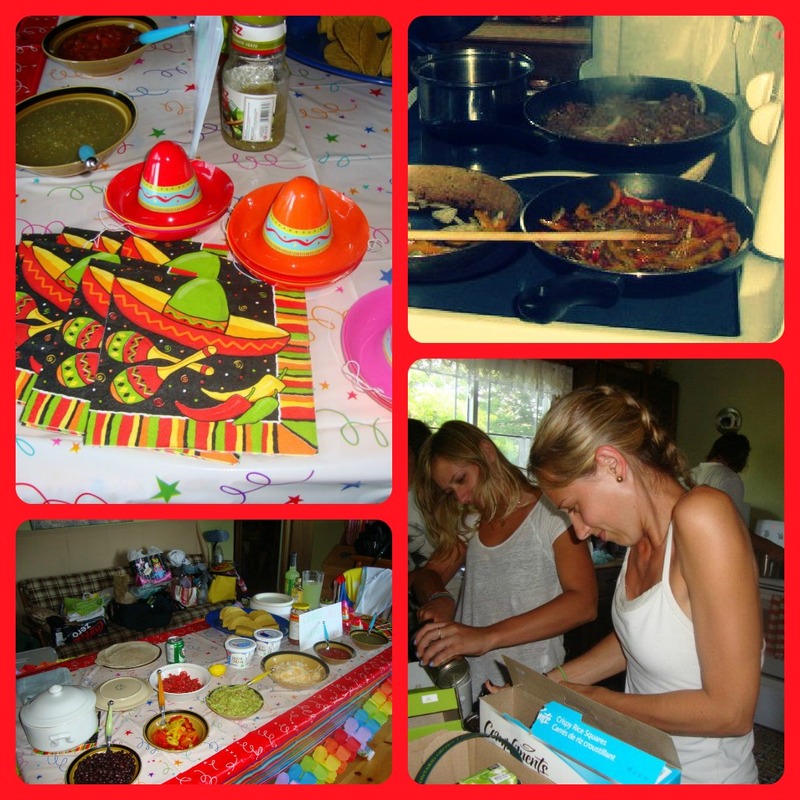 We cooked up some beef, sauteed some peppers, baked some pulled pork quesadillas, and put out a whole bunch of fillings for burritos and tacos including refried beans, black beans, Mexican rice, tomatoes, salsa & salsa verde, cheese, and guacamole. You really can't go wrong with Mexican. Inspired by these but not wanting to put THAT much effort into it (what? Look at how many steps are involved!) I tried to make a pinata cake. As most great ideas of mine tend to do, it failed when the cake fell apart once it came out of the pan. 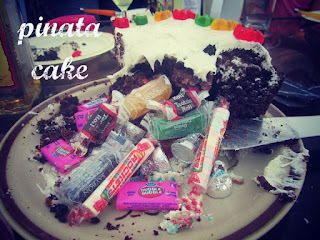 But with some icing and mushing together, the cake stood and was filled with candy to spill out once it was cut into. 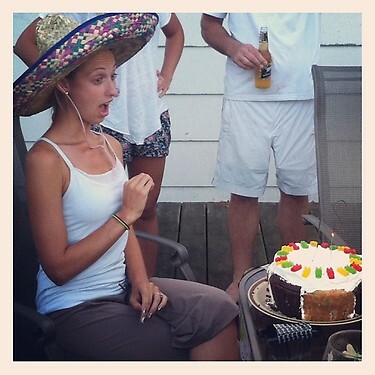 And since Sunday was my birthday I got to cut into the cake wearing the birthday Sombrero. Thanks to my family for these pictures (my camera's broken), a fun birthday, a very sweet shower, and an awesome long weekend! Fam Jam 2013: 363 days to plan next year's theme dinner.